Through seeing peoples reactions to my photos, I've learned that there are some things the people love to see, and other things that the majority of people just don't want to see at all. There is one species in particular that can generate both these responses and it is the orca. I was on an excellent all day whale watching trip last Saturday in Monterey Bay where we were lucky enough to encounter orcas. I published a shot that same day of a female orca in mid air above the bay that generated a great response - people love to see orcas do that kind of thing. On that cruise, we also got to see orcas hunt and kill a dolphin and mount a coordinated attack on a grey whale. This is what orcas do, it's how they survive. The rest of this blog post will cover those two events, so if you're one of the people who doesn't want to see that kind of thing, point your browser somewhere else right now. I certainly don't jump on a boat hoping to see animals get attacked or killed, but when the opportunity presents itself, I feel privileged and awed to witness this apex predator doing what it does. I also feel privileged to be able to document it for a wider audience to see too. 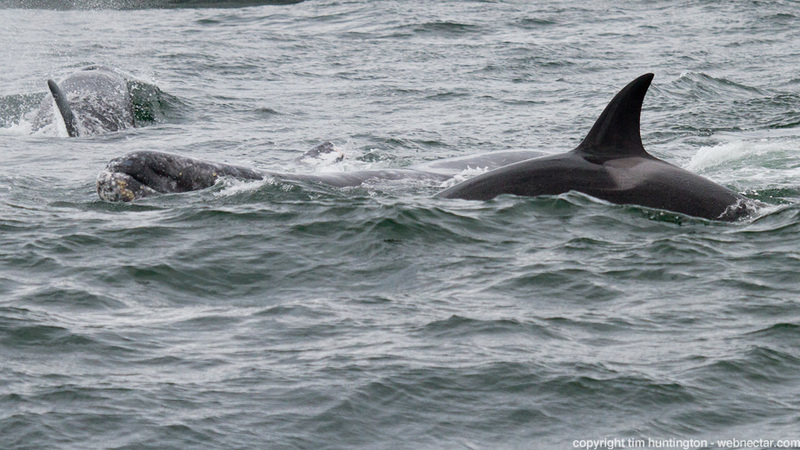 Our encounter with the orcas started when we were in the middle of a large pod of dolphins. Suddenly at one edge of the pod, the dolphins started stampeding in our direction, literally flying out of the water. 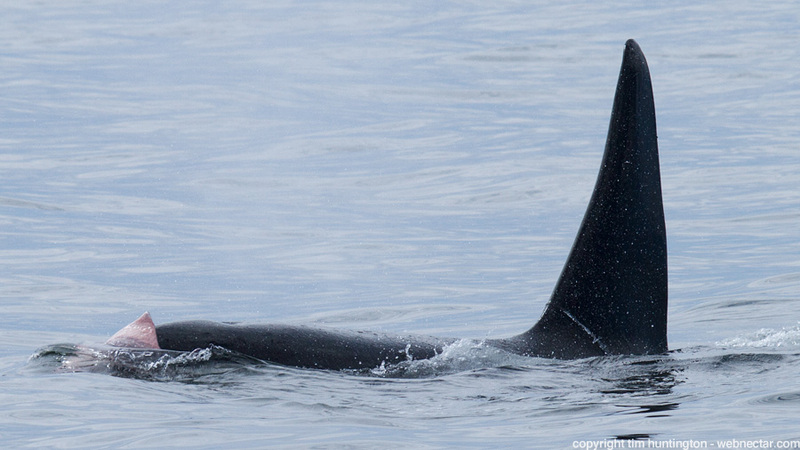 Within a minute, we'd spotted the reason for the dolphins' concern, a pod of orcas. The orcas headed in our direction too. Most of the hunt takes place underwater, but you can get an idea of what's going on from the time that the orcas spend at the surface and what they're doing, just swimming, charging after something, tail slapping etc. In the image below, you can see the either stunned or already dead dolphin with an orca approaching it. The orcas carried the dolphin around for a while and eventually ate it. 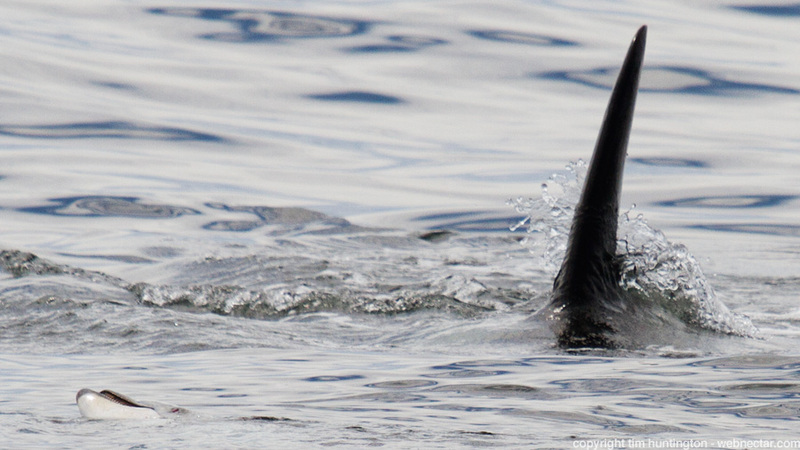 In the image below you can see a piece of the dolphin carcass in this male orca's mouth. The orcas then moved on and after a while we realized they were near a whale. We didn't think the two would interact, and they didn't for a few minutes, but then the orcas decided to attack. By this time, there were around 8 orcas in the area and they definitely coordinated their attack, coming in waves of two or three at a time. In the photo below you can see one orca moving away from the grey whale (in the center of the frame) as another orca comes in for an attack. The grey whale has rolled onto its back to protect its more vulnerable underbelly from the attacks. This does however mean that it has to roll back over to breathe. 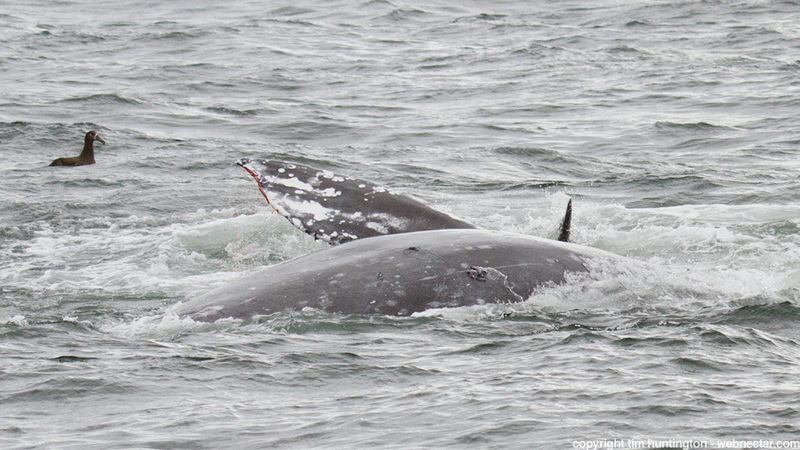 In the next photo, the grey whale is partially rolled over and taking a breath as another orca comes in for a strike. 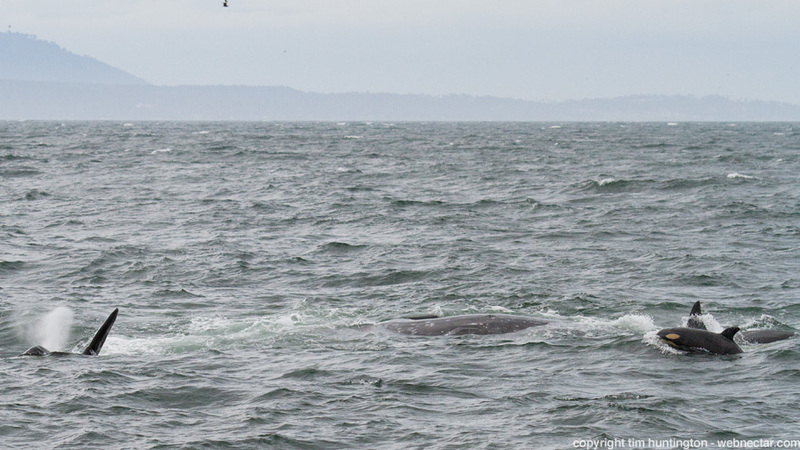 Look carefully in this image and you can see one of the grey whale's eyes just below the surface of the ocean as it does its best to survive the attack. 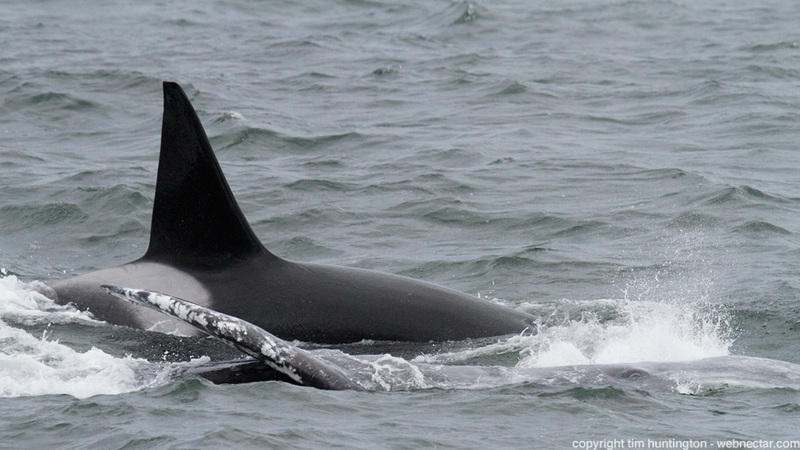 As well as repeatedly striking the body of the grey whale, the orcas appeared to be biting anything they could, which resulted in blood eminating from the whale's tail and in the photo below, one of its pectoral fins. Over the hour or so we were watching this spectacle, the whale would continue to right itself and breathe in between passes by the various members of the orca pod, and reports had the whale still alive and slowly heading towards the safer shallower water when the sun went down. There was no sign of a dead whale the next morning, so there's a good chance this whale survived. Orcas have been hunting dolphins and whales for thousands of years, let's hope they're able to continue to do so for thousands more.